As part of my MSC Cruises holiday package, the company arranged my return flights and overseas transfers on my behalf. I was told to arrive at London Gatwick Airport (LGW) for a British Airways flight to Genoa Cristoforo Colombo Airport (GOA). The outbound flight was scheduled to depart at a very reasonable 11.30 am. I arrived at the airport 2½ hours earlier, expecting a leisurely trip through the airport. The queues at check-in and security thwarted this plan. Do not confuse Genoa (otherwise known as Genova; Italy) with Geneva (Switzerland). Both flights were called around the same time but at opposite ends of the airport. I sat next to passengers who made that mistake, leading to a sprint across the terminal after failing to find the British Airways plane. As my ticket was part of a group booking by MSC Cruises, seats were allocated at check-in. Combine unfortunate timing with a full aircraft and it meant I had to sit on the opposite side of the plane to my wife and 15-month-old son. Sitting on window seats on opposite sides of the aircraft on different rows meant it was impossible to communicate with one another nor offer any help without inconveniencing four other passengers each time. Allocated seating is, of course, a caveat with the group booking method used by cruise lines such as MSC Cruises and is something worth bearing in mind should you be planning a family holiday abroad. This hiccup did not ruin the holiday by any means, but it was not the most stress-free of starts I wanted. The aircraft, an Airbus A320, was immaculate. The (presumably faux-) leather seats were comfortable, with more generous width and legroom in economy than I remember having on no-frills EasyJet and Monarch flights in recent years. The flight left 20 minutes late but arrived in Genoa five minutes ahead of schedule. Complimentary drinks and snacks were dished out once during the two hour flight. The MSC Cruises bus transfer arrived at the airport at 11 am for a 3.15 pm flight. The size of Genoa airport had both good and bad aspects. On the plus side, I whizzed through check-in and security in no time at all. Conversely, keeping a cranky toddler happy for four (very long) hours takes a lot of patience. Beyond security, the airport offered just one small café and one duty-free shop with the remainder of the space given over to rows of hard, plastic seating. Beyond a security booth was the departure gate area and a small café. Genoa Airport is a clean, compact airport but it is not somewhere you want to spend four hours waiting for a flight. In hindsight, taking a sightseeing tour of Genoa before heading to the airport would have been better. 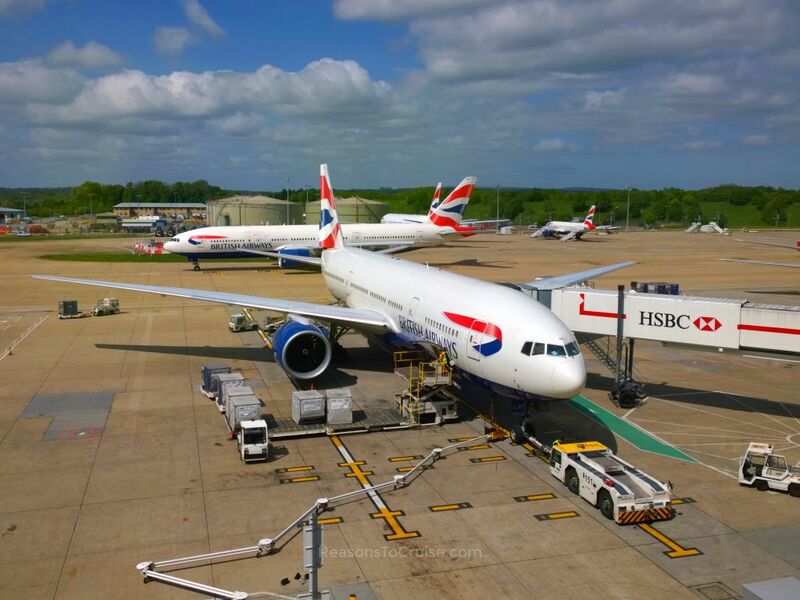 The aircraft arrived late due to a technical problem at Gatwick, delaying the departure time by half an hour. I landed back at Gatwick’s North Terminal 20 minutes late. Leather seats and reasonable legroom in Economy Class on the Airbus A320 made for a pair of comfortable flights. Complimentary drinks and snacks were served on both journeys. Despite the delayed outbound departure, the plane arrived in Genoa earlier than planned. Victims of the group booking system, I sat separated from my wife and infant son on the outbound flight. The departure time from Genoa was delayed by half an hour. There is no entertainment system onboard so take something to keep you occupied for two hours. Have you flown to Genoa, or did you fly to an alternative airport nearby? Let me know in the comments below. I was on a full flight between London and Genoa. The Airbus A320 was reasonably comfortable but there’s nothing to do for a few hours in the sky. Sitting separately from my wife and infant son was a disappointment, and an apparent flaw in the seat allocation system used by British Airways.